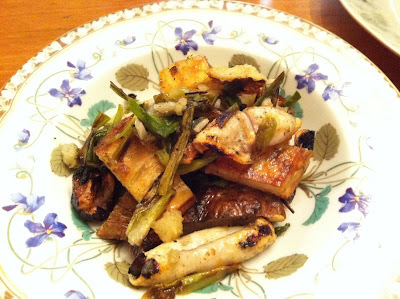 I’ve really enjoyed eating squid more this summer…tasty, easy to prepare, and affordable. I’ve been grilling and tossing it with some variation of fresh chopped tomatoes, chick peas, feta, olives, and lemon, but this time around I tried something a bit different, potatoes and scallions. I sliced my Idaho potatoes in thirds the long way and tossed them along with my whole scallions in a little olive oil, salt, and pepper while my grill was heating up. After placing the potatoes and scallions on the grill I turned it down to medium-low and flipped occasionally, the scallions were done after about ten minutes, the potatoes more like thirty. I turned the grill back up to medium-high and butterflied my squid by slicing them down one side then tossing them along with their heads in some olive oil, salt, and pepper. Once on the grill they took approximately five minutes per side depending on how crispy you like the edges. It was then as easy as tossing the squid with the cut up potatoes and scallions along with some extra virgin olive oil, and coarse salt to taste. The lemon vinaigrette I used on my side salad was a great accompaniment.